Large-scale distributed storage systems, store a substantial amount of data in a large number of low-cost storage nodes, maintaining the integrity of data by storing redundancy, which become key support on Internet and DCN applications. To compensate for potential losses of data, the amount of redundancy should be maintained such that when a node fails, the corresponding amount of redundancy should be regenerated. Large-scale distributed storage systems, generally, are featured by heterogeneous computing, storage and bandwidth. Existing works commit to reduce the regeneration time by either minimizing the regenerating traffic, or adjusting the regenerating traffic patterns, whereas nodes participating the regeneration are generally assumed to be given beforehand. However, real-world distributed storage systems usually exhibit heterogeneous link capacities, and the regeneration time is highly related to the selection of the participating nodes. Data update makes big challenges under coding mechanisms, since it will cause more computation and transmission, in comparison with duplication methods. In this talk, we studied the selection of storage nodes, provider nodes, newcomer nodes and even their joint selection. Based on this, we proposed corresponding coding algorithms and regenerating methods. Moreover, we studied and presented the optimization of bandwidth and I/O operation when coding and update coexist. Bio: Xin Wang is currently a full professor in the School of Computer Science at Fudan University. He received the BS degree in information theory and MS degree in communication and electronic systems from Xidian University, China, in 1994 and 1997, respectively. He received the PhD degree in computer science from Shizuoka University, Japan, in 2002. In 1995 and 1998, he was working on China’s pioneering telecom-level video conferencing systems and DVB-S systems with Huawei Inc., Shenzhen, China. His research interests include quality of network service, next-generation network architecture, mobile Internet and network coding. He is a distinguished member of CCF, and a member of IEEE, ACM. Currently he is in charge of research projects from Natural Science Foundation of China (NSFC), China high-tech project plan (863 Program), Shanghai Municipal R&D Foundation and etc. 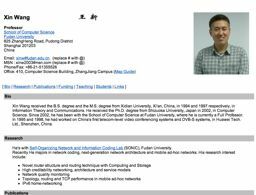 Now he leads the joint Android Lab of Fudan-Google and the joint SDN Lab of Fudan-Xilinx, respectively.